For me, it would be a little too much to waste a platform surely a little over 50 tons to put over it a gun very close to a portable/man-portable mortar of between 100 and 200 Kg. I think it would be an oversized platform and I think it would be redundant with the fact that some variants will carry the 2B11 Sani mortar. Ummm... have you seen the APC version with just a 105kg 30mm cannon? Every vehicle in an Armata unit will be armata based... are you suggesting the mortar platoon will have towed mortars? I rather doubt any Armata vehicles will carry Sani mortars. The variant with a weapon able to combine direct and indirect fire would be different, It would make 3 good variants for the 152mm caliber. If you have a vehicle (MBT) with a direct fire 152mm gun and a Coalition vehicle with an indirect fire capability why would you need a third vehicles that combines both capabilities? The MBT will be on the front line where the direct line of fire targets are. The Coalition will be further to the rear and can deliver fire where needed when called upon... where would this combined vehicle go? For the bigger calibers, the 152mm, 203mm and 240mm (around 250) make a good scale/range of calibers that would not change. I think these are calibers which use will be increased in the future. In some decades from now, when the use of the 125mm gun for tanks decline, I would expect the 152mm caliber to become the main caliber. About the 203mm and the 240mm calibers, I think its use will be increased from its current baseline of low use. For the range of calibers of 120mm to 130mm. I think its use will decline for self propelled platforms in the long term. In the other side, the 120mm has a good future as caliber for man-portable mortars. 125mm and 120mm are good enough at the moment and the 152mm is fine for artillery. Improved accuracy and specialised rounds make it even more effective over greater ranges. Sometimes very heavy shells could be useful so a small reserve of 240mm and 203mm weapons makes sense but as general weapons they are too big and too heavy and more expensive than is needed. There is potential in very specific situations, but for most of the time carrying 40-50 125mm rounds in a tank or 60-80 120mm rounds in a mortar carrier makes rather more sense than moving to much bigger heavier rounds prematurely. About the 130mm, it would be easy to remove this caliber from the land forces, since it is only used by the A-222, with only a few units, but its use is bigger in the sea based forces. Weapons of 130mm are still being included in the design of modern ships like the Project 22350 (Admiral Gorshkov class). Then its total retirement is unlikely in at least 5 decades. I think with the time they will go to the 152mm. The 130mm round is pretty much already out of the land forces inventory... the M46 is no longer a front line weapon... it uses a two piece round called 3OF33. The Bereg is a navy system of coastal defence and uses the same one piece A3-UZS-44 round as the AK-130 naval guns... it is their 125mm calibre and will likely remain in use for some time. Also to note that I would not expect 120mm variants for the Armata, Kurganets and Bumerang platforms because I expect infantry variants that carry 2B11 Sani 120mm mortars as portable/man-portable equipment. A vehicle mounted 120mm mortar is not the same as a man portable model of the same calibre. You can't replace the 125mm gun of a T-90MS by having the gunner carry an RPG-28 (which is also 125mm calibre). But the use of weapons in the Armed Forces of Novorussia would be relevant to analyze the presence or not of some weapons in the Armed Forces of Russia, because Russia has been also an important weapon supplier for them. I have seen rebels with PTRD-41s... does that mean Russia still uses them? In other words, if we see a weapon used by Novorussia it can come likely from two sources. Ukraine and Russia. Bad logic again... there is something called a black market... when money is involved it could come from anywhere. It means no-one of the D-20 howitzers of Novorussia had its origin in the Russian Armed Forces. It likely means that Russia today has not them available, because if available there is not reason to provide not Novorussia with more of them. Says who? We don't know what they have or have not got and from where or from whom they got it. Novorussia has no Su-35s so I guess Russia has no Su-35s? This is the point. I think that if it would be available in Russia, we would see more D-20s in the Armed Forces of Novorrussia than those captured to Ukraine. This assumes that Russia is prepared to give the rebels anything they want... we know Russia had tens of thousands of T-54s and T-55s... why don't we see those in the Ukraine now? Is that evidence that Russia now has no surplus equipment at all? A close argument can be made for the ZU-23-2 and for the rest of the weapons included still by The Military Balance 2016 as present for the reserve of Russia. In the case of the ZU-23-2 it is a little more difficult to explain its presence in the Armed Forces of Novorussia only by Ukranian origin thanks to the unknown number of pieces captured in Crimea. And for the rest, the total lack of use, likely means that are not available for both Russia and Ukraine. Things in reserve in Russia are in reserve for Russia... what idiot would give away their reserves? When new equipment becomes available then you replace it with newer stuff newly retired but you don't just piss away your reserves. - I commented in the armata thread, that I'm not sure about the need of a weakly armed APC variant for the armata platform, In a platform as expensive as the armata, I'm not sure if it is necessary to go to differenced variants of IFV and APC. Also the IFV and the APC variants, would be the variants that carry the portable/man-portable 2B11 Sani mortars of 120mm as part of the infantry equipment. - No I do not think the Armata platform will use towed mortars that need a tractor element in the old mold. Only will use self propelled and light portable/man-portable mortars under 200Kg (maybe less in future weapons). - There are differences between the 2B11 Sani mortar and the guns carried by the 2S9 or the 2S23. But these differences are not big enough to have both working together as different weapons. I think Russia can go in the future to a 152mm system able for indirect fire for self-propelled vehicles. - It is the first time that I hear about the 2S35 152mm hability for indirect fire. If this would be right, it would not be necessary another direct/indirect fire weapon of 152mm, but I doubt you are right. I do not see it reflected in the sources. - In the 120-130mm range of calibers, the main caliber, the most used, is the 125mm caliber. All the tanks of Russia use today 125mm weapons. The peak for the use of the 125mm caliber surely was reached just before the begin of the withdrawn of the T-64 from the Russian Armed Forces. Unless you think the 125mm caliber is the tank caliber forever, or unless you close your eyes, you will see the use of the 125mm caliber to decline. In adition to the expected evolution of the 125mm caliber, we have still the use of the 122mm caliber remaining very high. The peak in the use of the 122mm for self propelled weapons was reached surely between 10 and 25 years ago, before the upgrade to 2S34 begins. The use of the 130mm is very unlikely to grow, and surely the grow of the 120mm by the production of 2S34 and 2S36 will not reach the necessary number of units to cover the decline of the rest. At this point we have the 122mm and the 125mm that passed their peaks, the 130mm not very used but stable, and the 120mm with a modest growth. To deny the overall decline of the use of 120-130mm range of calibers is to be not in the reality. Only a big war can impulse a growth in their again and only for the short term (the timeline of the war). - Unless you think it is possible to find weapons over 100mm free in the farms of Novorussia, or unless you think weapons over 100mm can travel free by Ukraine or Russia until Novorussia from third countries, the presence of these weapons in the Armed Forces of Novorussia can be explained only by the captures to Ukraine (from warfare storage, museums, from Crimea, or from the frontline), its primary source, or by its presence in the Russian Armed Forces equipment, basically from their reserves. What I said is very logical. I'm far from the narrative of sources like The Military Balance about the level of the intervention of Russia in the war, but it is obvious that Novorussia has some access to Russian armament in the needed degree. The old weapons stored in the reserve are to be used and to send some Msta-B instead of D-20 would be a mistake for Russia, like to send some D-30 instead of M-30. It leads to me to think that the D-20 and the M-30 are not present in the Russian inventary, which is logical taking into account that more modern arms like the T-64 were retired and scraped a few years ago. Other thing are small arms like the example you commented. - I'm not saying that Russia would give to Novorussia everything they want, but yes the necessary to survive. This is obvious. This is why Novorussia has not Su-35 and other modern armament. If you reject my opinion because of this, you should reject first the data of sources like The Military Balance, that talk openly about a Russian intervention in the war far more intense than what I say. - And yes, I do not think Russia keeps their T-54 or T-55. The most credible sources today say it, in agreement with the reports of its scrape some years before the war in Novorussia. I do not know why you think it is possitive to say that Russia keeps old towed artillery from the 1930s, 1940s and 1950s. And also I do not know why you think it is positive to say that Russia keeps their T-54 and T-55. If I see to some source, offering data that delays the adoption of new armament, and delays the news about the retirement of old weapons, I tend to think that they want to offer a distorted image about the real level of the Russian Armed Forces. Current tank and motor rifle brigades have BMPs and BTRs, which equate to IFVs and APCs. Do you think they will change with much heavier armour? The BTR-T based on the T-90 has a light armament to maximise troop capacity and give some self defence capability. AFAIK 120mm infantry mortars would be towed around the battlefield by a truck that carried the crew and ammo. Therefore it would not be included in an Armata brigade as the role of 120mm mortar would be taken by the 120mm mortar carrier. So you agree with me... the only light man portable "mortars" will be 30mm or 40mm or 57mm grenade launchers or 82mm mortars. The 120mm weapons are not man portable and even if they were how many rounds could they possibly carry? You mean like double the range? 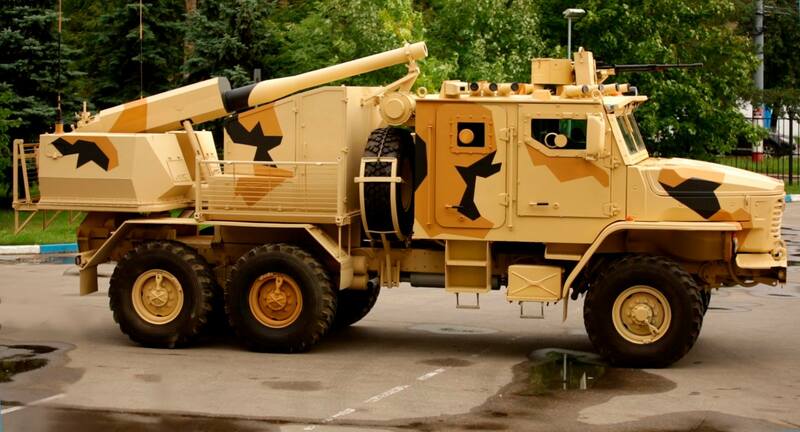 The 120mm gun/mortar of the Vena has a range of 13km, while the Sani has a range of 7km. Also I would suggest the stabilising and aiming equipment on an Armata based mortar carrier would be rather more sophisticated than anything on any towed mortar. Not to mention protection from enemy small arms fire in the Armata based mortar carrier. Coalition is the 152mm artillery vehicle... of course it can fire indirectly at targets... that is what artillery does. The tank version of the armata with a 125mm gun currently can be fitted with a 152mm gun... and will likely not have the capability to increase elevation enough for indirect fire... so it will be the direct fire model... yes? Unless you think the 125mm caliber is the tank caliber forever, or unless you close your eyes, you will see the use of the 125mm caliber to decline. They have not deployed any in 152mm so how can it be called in decline when it is the only tank gun in Russia? In adition to the expected evolution of the 125mm caliber, we have still the use of the 122mm caliber remaining very high. The peak in the use of the 122mm for self propelled weapons was reached surely between 10 and 25 years ago, before the upgrade to 2S34 begins. the D-30 and the 2S1 were very widely deployed weapons and no doubt many are still in service, but why would they replace the 122mm guns in the 2S1 with 120mm gun/mortars if they were not withdrawing the 122mm calibre? In the long barrel gun/mortar version the 120mm is almost as powerful as the 122mm gun but also has a much wider range of ammo available and of course can fire mortar rounds of domestic and foreign design. In terms of firing range there is not that much difference while the shell rounds for the 120mm weapon have bag propellant so the charge can be varied making it a much more effective weapon. (Note weapons with fixed propellant have problems hitting close targets indirectly because the charge cannot be reduced when fired at high elevation the full charge sends the projectile very high into the air for a very long flight time... during which the target could move and the wind effects the aim point for a much longer period of time. In comparison a shell from a 120mm gun can use a tiny charge to loft it up over cover on a much shorter flight to the target... hits it quicker and spends less time being blown off course so is more accurate. The use of the 130mm is very unlikely to grow, and surely the grow of the 120mm by the production of 2S34 and 2S36 will not reach the necessary number of units to cover the decline of the rest. At this point we have the 122mm and the 125mm that passed their peaks, the 130mm not very used but stable, and the 120mm with a modest growth. To deny the overall decline of the use of 120-130mm range of calibers is to be not in the reality. Only a big war can impulse a growth in their again and only for the short term (the timeline of the war). The 130mm is dead to the land forces... it is totally obsolete. The 125mm calibre will remain as long as T-72/90 vehicles remain in service as there is little chance they can convert to 152mm calibres and of course the Kurganets and Boomerang and Typhoon are unlikely to be able to pack a 152mm calibre gun either so the future for the 125mm is relatively safe until EM guns of much smaller calibre enter the picture. the Navy will certainly continue to use the 130mm gun but will introduce 152mm guns for their cruisers. - Unless you think it is possible to find weapons over 100mm free in the farms of Novorussia, or unless you think weapons over 100mm can travel free by Ukraine or Russia until Novorussia from third countries, the presence of these weapons in the Armed Forces of Novorussia can be explained only by the captures to Ukraine (from warfare storage, museums, from Crimea, or from the frontline), its primary source, or by its presence in the Russian Armed Forces equipment, basically from their reserves. If Novorussia can get 100mm plus weapons from the Ukraine or Russia without being spotted or stopped then why do you think they can't get them from anywhere else without being spotted? but it is obvious that Novorussia has some access to Russian armament in the needed degree. The old weapons stored in the reserve are to be used and to send some Msta-B instead of D-20 would be a mistake for Russia, like to send some D-30 instead of M-30. It leads to me to think that the D-20 and the M-30 are not present in the Russian inventary, which is logical taking into account that more modern arms like the T-64 were retired and scraped a few years ago. You are making too many assumptions with no evidence or foundation in reality. If you are suggesting that 100mm plus calibres can cross the Russian border then why could they not arrive by sea from other places? Lack of items in Novorussian inventories does not make it clear what Russia has or has not in its inventory. If you reject my opinion because of this, you should reject first the data of sources like The Military Balance, that talk openly about a Russian intervention in the war far more intense than what I say. Military Balance just guess and are not an authoritative source on the reserves of Russia. It often costs more to scrap an old item than it does to store it in a condition that would allow it to be returned to service at some time in the future. Just look at the recent aircraft training exercises.... all those L39s sitting on the ground as targets in the Aviadarts events... were they plastic mockups? Some old equipment can be targets, some can be sold to allies still using those products, some more can be kept in reserve for situations where they might be useful to yourself or others. Russia might not need old 57mm guns and old 57mm ammo, but in Syria and Iraq they might be useful... the Russian Army and Navy might be getting some new 57mm guns and some new 57mm ammo, but the old stuff is of less use to Russia... no need to store it now. GarryB wrote: Current tank and motor rifle brigades have BMPs and BTRs, which equate to IFVs and APCs. I would not rule out some change. APCs on armata platforms will be expensive and it would make sense to provide them with higher self defense capacity that what we today understand as APC. When the platforms were smaller and cheaper it was cost effective to have some infantry vehicles more oriented to fight (IFV) and others less armed, and even less armoured, more oriented to transport of troops, because APCs were significantly cheaper than IFVs. But for armata based IFVs and APCs the difference is far lower in relative terms. GarryB wrote: AFAIK 120mm infantry mortars would be towed around the battlefield by a truck that carried the crew and ammo. Therefore it would not be included in an Armata brigade as the role of 120mm mortar would be taken by the 120mm mortar carrier. If Armata units are only for armata platform vehicles, trucks to carry mortars would not make sense. If I'm not wrong the reports talk about 2B11 Sani mortars carried as part of the equipment of the infantry troops carried in the Armata based IFVs (and maybe APCs). GarryB wrote: So you agree with me... the only light man portable "mortars" will be 30mm or 40mm or 57mm grenade launchers or 82mm mortars. The 120mm weapons are not man portable and even if they were how many rounds could they possibly carry? The 2B11 Sani, is not exactly man-portable, but it is portable in every infantry vehicle recently designed and in some of the older like the MT-LB. If I'm not wrong its use would be close to the use of the weapons that you mention. Only being a little bigger. As I do not expect to see two rifles of the same caliber in the same unit, I do not expect two mortars of the same caliber in the same unit. The presence of the 120mm mortars in the armata units is assured, but its use would be in the form of a 2B11 Sani mortar, or in the form of a 120mm direct/indirect weapon like in the 2S36. Very unlikely to see both. Until now the selected option seems to be the 2B11 Sani mortar as infantry mortar according to the reports, which in my view makes sense (I expect bigger weapons for direct/indirect fire from the armata platform). GarryB wrote: Coalition is the 152mm artillery vehicle... of course it can fire indirectly at targets... that is what artillery does. These are two of the 3 artillery types of weapons that are succeeding today, as I commented in a previous comment, but the 3 type is necessary because no-one of these is able to fire in mortar style. I never heard about the 2S35 being able to fire in mortar style. The peak in the use of the 125mm caliber was reached when all the T-90, T-72, T-80, 2S25 and T-64 were in service (active or reserve). The reduction in the number of units of the sum of all them would be in fact the begin of the process of declining in the use of this caliber. I said not it before, but I have not a trouble with it. While for the 160mm the facts seem to go ahead you, for the 122mm caliber you seem to go ahead the facts. The replacement of some 122mm weapons by 120mm weapons is a fact, the use of the caliber is in decline in the last years, but the rate of replacement is very low (1% or 2% of the total number of 2S1 have been upgraded to 2S34). I do not expect to see this caliber disappearing in less than 10 or 15 years. GarryB wrote: The 130mm is dead to the land forces... it is totally obsolete. In the refered to the 130mm my comments are refered obviously to A-222 and to its use in the ships of the Russian Navy. GarryB wrote: If you are suggesting that 100mm plus calibres can cross the Russian border then why could they not arrive by sea from other places? I'm sjust suggesting that this premise is only right in one case (with the consciousness or knowledge of the Russian government), and this is not compatible with the second part of your sentence. Are you really suggesting that someone can travel by Russia with 100mm+ weapons from third countries without being discovered by the Russian security forces? Here is the real WTF. GarryB wrote: Lack of items in Novorussian inventories does not make it clear what Russia has or has not in its inventory. It just agrees and reinforces the reports of the sources that are giving the best updated reports about the Russian military equipment. Then which would be the authorizative sources where you see that the 160mm are still available in the Russian reserve? GarryB wrote: Just look at the recent aircraft training exercises.... all those L39s sitting on the ground as targets in the Aviadarts events... were they plastic mockups? I can perfectly agree with you on this about the L-39. It is significantly more modern weapon than the others that we are commenting (1970s), and there are public reports about its total retirement in the short-term. APCs on armata platforms will be expensive and it would make sense to provide them with higher self defense capacity that what we today understand as APC. All vehicles in an armata unit will be armata based.... are you suggesting they wont have APCS because of the cost of operating them? would you there fore also suggest they wont have armata based command vehicles because such things would be expensive and poorly armed? Will commanders in armata divisions scoot around in Jeeps? When the platforms were smaller and cheaper it was cost effective to have some infantry vehicles more oriented to fight (IFV) and others less armed, and even less armoured, more oriented to transport of troops, because APCs were significantly cheaper than IFVs. But for armata based IFVs and APCs the difference is far lower in relative terms. An APC is used for troop transport only. An IFV is designed to offer fire support to the troops it transports. There is plenty of scope for both types of vehicles in current and future units. If I'm not wrong the reports talk about 2B11 Sani mortars carried as part of the equipment of the infantry troops carried in the Armata based IFVs (and maybe APCs). They are almost 200kgs each are you suggesting they will tow these mortars... they can't fit them inside the vehicles. Where are they going to store the ammo for the towed weapon? Until now the selected option seems to be the 2B11 Sani mortar as infantry mortar according to the reports, which in my view makes sense (I expect bigger weapons for direct/indirect fire from the armata platform). So you are suggesting that they wont have APC versions of the armata, and that some of the armata IFVs will tow around 120mm mortars... in addition to the 57mm main guns on those vehicles with extra 120mm ammo for the mortars. You are also suggesting that the mortar regiment with the armata division will have a totally different calibre mortar round... 160mm or 240mm mortar. Can I say I don't agree. The whole point of armata based vehicles is to protect the crews and the troops... why on earth would you then tell your troops to get out to set up a fricken 120mm mortar to fire at targets 7km or less away? 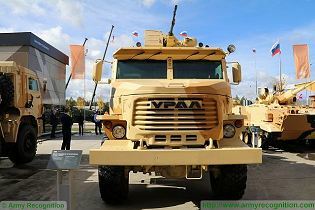 If they do have a prime mover based vehicle... basically an armata based MTLB then that would be what would carry any towed weapons... and I would suggest only lighter units would deploy such weapons... an armata unit will have a Vena equivalent mortar carrier vehicle with 70-90 rounds of ammo in 120mm calibre. The coalition is able to fire in mortar style with propellant bags able to fire at short and long range targets with high elevation. The armata force will have Mortar brigades to fire in mortar style too. Modern Russian units have 152mm tube, Rocket (122mm,220mm,300mm) plus mortar calibres (120mm) as standard artillery support. TOS is an engineer vehicle used to clear minefields too. It seems pretty obvious that if they are replacing 122mm calibre weapons in self propelled vehicles with 120mm gun/mortars that the same replacement will start in towed artillery and in new vehicles being developed. So what you are saying is that the Russian government is allowing heavy weapons to go to the rebels but will stop or block weapons from third countries getting to the rebels? There would be very few 160mm mortars located near the border with Ukraine and very little reason to move anything there where locals might decide to allow them to leak over the border... especially because of the size of the weapons and total domestic lack of ammo makes such a transfer a waste of time and money. There has been nothing developed to replace their capability. I can perfectly agree with you on this about the L-39. It is significantly more modern weapon than the others that you are commenting (1970s), and there are public reports about its total retirement just now and in the following years. Modernity is nothing to do with this. The L39 is being replaced and has little chance of being needed again in the future. Scrapping them costs money, so it is cheaper to take the useful bits out of them and then blow them up in training. A 160mm mortar on the other hand has capabilities that the current in service 120mm mortars don't possess, so it makes sense to keep them in reserve for specialist situations. For instance fighting in mountains or heavily built up areas their range and power are useful. For the 240mm mortars even more so with the guided shells developed for them. You don't just decide arbitrarily that they are obsolete and scrap them or throw them away. Just because they are x number of years old you don't just get rid of them. If the ammo is no longer in production and existing stocks are getting to their expiry date you sell them or gift them to an ally, but if they are perceived as being useful weapons then you set up some low rate production of new ammo and keep them in reserve. Looking forward about the Russian artillery, talking about different calibers, different platforms and different types of weapons, this is what I would say. At this point, the modern platforms that can be useful for artillery purposes are defined. They are the Armata, the Kurganets, the Bumerang and the BMD-4M platforms. I think the use of the Typhoon, Bulat or Atom infantry platforms will be very likely only as IFV and/or APC. Talking about calibers, for the bigger calibers, the 152mm, 203mm and 240mm (around 250) make a good scale/range of calibers that would not change. I think these are calibers which use will be increased in the future. In some decades from now, I would expect the 152mm caliber to become the main caliber. About the 203mm and the 240mm calibers, I think its use will be increased from its current baseline of low use. For the range of calibers of 120mm to 130mm. I think its use will decline for self propelled platforms in the long term. In the other side, the 120mm has a good future as caliber for portable/man-portable mortars. In overall terms we can say that the use of the 122mm caliber is still very high despite to be declining. Taking into account all the areas where it was used , the use of this caliber was reached very likely in the 20th century, Surely the last weapon in service of this caliber will be the 2S1, but I do not expect its retirement in the short-mid term. The total retirement of this caliber can take still between 10 and 20 years. The use of the 130mm is low today. It also declined since the past century after the retirement of some weapons like the M-46. Today is used in the A-222 land based platform and in some ships of the Russian navy. Weapons of 130mm are being included in modern ships like those of the Project 22350 (Admiral Gorshkov class), which mean that a total retirement is out of the plans for at least 50 years. The 125mm caliber is the most important and the most used caliber in the range between 120 and 130mm. In this case the peak in its use was reached very likely just before the begin of the retirement and scrapping process of the T-64. Unless there is a big war, it is very unlikely that Russia reachs again the number of units with 125mm weapons of the time when the retirement of the T-64 begins (the high number of T-64 retired and scrapped makes it very unlikely). The alone caliber of the range of 120-130mm calibers which use can be still growing isn the 120mm caliber, but its grow seems not to be covering the decline units reduced of the rest of the calibers of the range. I think this caliber has a good future, but more as caliber for portable/man-portable mortans than as caliber for new self-propelled weapons, after the introduction of the 2S36 which is based on the smallest of the new platforms (BMD-4M). - The tank/antitank guns, more oriented to agile direct fire. Modern examples: T-14 and 2S25 Sprut-SDM-1. - The guns that want as long range as possible for direct fire. Modern examples: 2S35 152mm. - The guns that want to combine direct and indirect fire, including mortar configuration. Modern examples: 2S34 and 2S36. It is likely than in the near future we see some tank/antitank weapon of 152mm, which seems to be next in line after the 125mm caliber. Also, I think the successful weapon of 120mm that combines direct and indirect fire, including mortar configuration can be applied in the future to bigger calibers. - TOS BM-2: 300mm, 220mm and 122mm MRLS with bigger modules than the Tornado MRLS. - 2S?? : 240mm that combines direct and indirect (mortar) fire. Successor of the 2S4. - 2S?? : 203mm for long range direct fire. Successor of the 2S7. - 2S?? : 203mm that combines direct and indirect (mortar) fire. New. - 2S35: 152mm for long range direct fire. Successor of the 2S19. - T-?? : 152mm for agile direct fire, tank/antitank role. Successor of the T-14. - 2S?? : 152mm that combines direct and indirect (mortar) fire. New. - T-14: 125mm for agile direct fire, tank/antitank role. Successor of the T-90. - 2S?? : 152mm for agile direct fire, antitank role. Successor of the 2S?? 125mm on the Kurganets platform. - 2S?? : 152mm that combines direct and indirect (mortar) fire. Successor of the 2S34. - 2S?? : 125mm for agile direct fire, antitank role. Successor of the BMP-3. - 2S?? : 152mm for agile direct fire, antitank role. Successor of the 2S?? 125mm on the Bumerang platform. - 2S?? : 152mm that combines direct and indirect (mortar) fire. Successor of the 2S23. - 2S?? : 125mm for agile direct fire, antitank role. New. - 2S37(?) 2S25 Sprut SDM-1: 125mm for agile direct fire, antitank role. Successor of the 2S25. - 2S36: 120mm that combines direct and indirect (mortar) fire. Successor of the 2S9. Note that I included some variants for tank/antitank weapons for a longer timeline as successors of the initial variants of 125mm that can be expected. Also to note that I would not expect 120mm variants for the Armata, Kurganets and Bumerang platforms because I expect infantry variants that carry 2B11 Sani 120mm mortars as portable/man-portable equipment. The new land based platforms are ready, it is the time to introduce changes, maybe important changes, that will configure the model of artillery for the next 50-60 years. I have not a fixec opinion about the issue of the IFV and APCs on the armata platform. What I say is that it is possible to see the APCs on the armata platform armed more in line with the current IFVs. The reason for it is that the armata platform itself, without weapons is significantly more expensive than smaller platforms, and to give them weapons for IFV level likely makes not a big difference in cost from to give them weapons for APC level. Applying standardization rules to this argument, it would mean that I would not rule out to see the orders for APCs for armata platform units to be covered by T-15s. As example, roughly, if some armata unit needs theorically, roughly, 4 T-15 IFV and 4 armata APC, I would not be surprised if the need is covered by 8 T-15 IFV. The unit would be better protected. About the presence of the 2B11 Sani in the armata units, we are not understanding the reports the same way. I do not expect trucks (likely unarmoured) in the armata units to charge the mortars. It would not make sense. Also I do not expect vehicles of armata platforms acting as tractors of these small mortars like if it would be 2A65 Msta B. The two alone logical options is to carry the mortars inside, or to have them mounted in the platform like in the cases of the 2S34 and the 2S36. By standardization reasons I expect one of the two options for the armata units, but not the two at same time. I think, it is my understanding, that when the reports talk about armata based vehicles carrying 2B11 Sani mortars, they talk about the mortar traveling inside, the same way than a smaller 2B24 mortar. If the reports would be talking about a mortar of 120mm mounted in armata platforms like in the 2S34 or 2S36, the reports should be talking about the 2A80 120mm weapon instead of the 2B11 Sani. This is all what I can say about it. It is the first time I hear about the 2S35 firing mortar style. Can you provide some link in support of it? If the 2S35 can fire at mortar style, what is the problem with my comments about armatas with 152mm guns that combines direct and indirect fire including mortar configuration? According to your comments the 2S35 would be doing what I was thinking about. If the 2S35 can fire at mortar style, what is the problem when I say that it is more likely to see 152mm weapons firing at mortar style mounted on armata platforms than 120mm weapons firing at mortar style mounted on armata platforms? If the 2S35 can fire at morter style, how can you say that there is nothing matching the capabilities of the 160mm mortars developed in the 1940s? eehnie wrote: Then which would be the authorizative sources where you see that the 160mm are still available in the Russian reserve? Then do you consider your own opinion an authorizative source about the presence of the 160mm mortars in the Russian reserve? Everytime I understand less about your comments on this. But not all the armament in the hands of Novorussia is explained this way. I'm far from the narrative of the big intervention, but some cases are obvious (like the presence of BPM-97 or T-72) and other cases are likely. T-72 from the black markets without the consciousness of knowledge of the Russian government? very very unlikely. From third countries? even more unlikely. It is obvious that Russia needs not to talk with other countries to allow some supply of the needed weapons for Novorussia, and for sure would not allow big caliber weapons moving uncontroled by its territory (as example from Azerbaijan or Kazakhstan until Novorussia, even from Belaruss). Also it is far easier for the US to clontrol the weapon inventaries of these countries than the inventaries of Russia. It makes not sense to me. Finally, if there is some consciousness of the Russian government, about the supplies of weapons to Novorussia, it is obvious that only would be allowed the supplies that are more in the interest of Russia, like to allow the movement of the oldest material available in its reserves. Checking the material used by Novorussia, and its origin I think we can have an accurate idea of the oldest land weapons available in the Russian reserve. Only that. Of course Russia says what it is in its interest, and I understand it. Not a problem for me. The reason for it is that the armata platform itself, without weapons is significantly more expensive than smaller platforms, and to give them weapons for IFV level likely makes not a big difference in cost from to give them weapons for APC level. The focus of the new generation systems/vehicle families, is about crew and troop protection. Costs are kept down through standardisation... so having a 57mm gun and largely the same sensors on all the vehicle types for the same role is one way of saving money... the IFV on the Armata and the boomerang and the Kurganets and the typhoon will be as far as possible the same with the same turret and the same crew positions etc etc. The concept however is not about making the military cheaper, but to make it safer and more likely to survive in combat. The concept of the APC is not to save money... the purpose of an APC is to increase the number of troops delivered to the front line... so you can use 10 APCs with 12 troops in each one instead of having to have 20 IFVs with 6 troops in each. For a while there was speculation that the heavy armament of the BMP-3 would mean it would deliver troops and then the empty BMP-3s could be used as a mobile reserve of light tanks, but that was only western speculation AFAIK. I would suggest a tank level APC or IFV could look after itself and be more aggressive in supporting its dismounted troops but I doubt they would just leave their troops and go off on another mission. A Typhoon tank commander should be able to climb into an Armata tank and do his job the same as with the vehicle he is familiar with. The Armata will obviously have much better protection and lower acceleration and lower top speed and snorkling ability rather than full amphibious capability but in terms of sensors and systems and mostly weapons they should be the same. That means instead of 2,000 IFV turrets for Armata vehicles they will be buying 6,000+ turrets for the armata, kurganets,boomerang, typhoon vehicles... and they wont need 4 different IFV turret designs. As example, roughly, if some armata unit needs theorically, roughly, 4 T-15 IFV and 4 armata APC, I would not be surprised if the need is covered by 8 T-15 IFV. The unit would be better protected. There will be no difference in terms of protection between the armata IFV or the armata APC. The only difference will be in fire power and sensors. What do you mean mortar style? 152mm guns already have a choice of propellant loads and there are reduced loads, standard loads, and extended long range propellant charges for 152mm guns. The combination of different elevations of gun and different propellant loads means multiple shells can be rapidly fired at different angles so that the rounds take different trajectory paths and arrive on target at one time. Coalition will not be used in a direct fire role just like MSTA will not... those enormous turrets would be too vulnerable on the front line to enemy weapons to last very long. The 152mm tank gun armed vehicle will have a much lower profile turret and likely no high elevation capability and will only be used in the direct fire role. So we have a future version of the MBT with a 152mm gun for the direct fire role against soft and hard targets and we have an artillery vehicle with indirect fire capability but would never be used in the direct fire role. There is no need for a vehicle with direct fire and indirect fire capability... you only use direct fire capability with HE rounds for accuracy and guided shells of all types already provide that with indirect fire. The MSTA can fire high elevation long range... why do they bother with NONA and Hosta and VENA? The simple fact is that Coalition can hit targets 70km away and will likely not operate right on the front line with the IFVs and MBTs. The 120mm gun mortar equipped vehicles with an effective range of between 7km and 13km will operate near the front line and deliver accurate and powerful fire to support the troops. The Coalition can fire at angles above 45 degrees, but that does not make it a mortar. I have read that the M160 was not deployed widely because its features of weight made it less useful in mobile warfare. In use however it was found to be very useful in mountain warfare and they were being kept in reserve for mountain warfare units. I have never read that they have all been withdrawn from service, and apart from your claims that they have not been supplied to the Ukraine conflict I have not seen any claims by anyone they are no longer in reserve. Checking the material used by Novorussia, and its origin I think we can have an accurate idea of the oldest land weapons available in the Russian reserve. Only that. If the Russian government is supporting the rebels either by supplying weapons or ignoring those that do supply weapons then why would they allow useless crap to be sent rather than something useful and/or effective? Why aren't we seeing SA-1 missiles being transfered? They made hundreds of thousands of those missiles you know. I just don't buy the logic that Russia will block third party sources of weapons from rebels you claim they support, and that they will send old crap to empty rubbish out of their reserves rather than what might actually be useful for the rebels. How many mountain units would be near the Ukraine border? Do you think mountain units will keep their 160mm mortars in reserve on the border with the Ukraine? Will they sent to all corners of Russia for old crap to give to the rebels in the Ukraine? Perhaps we can agree to disagree. To be able to fire in mortar style would be to be able to fire like a mortar, covering all the habitual features of a mortar, and to be able to use mortar ammunition. Then, after your last comment I understand you think this is not the case of the 2S35. This would be also what I was understanding from the reports. I was understanding that the 2S35 is not able for use as a mortar. After see 3 successful types of weapons in the recent years, as I said some comments ago, Taking into account that the use of 2B11 Sani 120mm mortars and armata platforms with 2A80 120mm weapons mounted is unlikely at same time by standardization reasons, I think it would be room for a new weapon of 152mm in the mold of the 2A80 weapon of 120mm, that can be used as mortar perfectly. I commented a number of variants with weapons over 100mm for the armata platform, taking into account, that some can be bataillon weapons, some can be regiment weapons, others can be brigade weapons, others division weapons, and some even army weapons. My words are based on the fact that good sources, like warfare.be include not the M-160 mortar in their "Russian Arms Cathalog" which includes, in adition to the active weapons, the weapons that they think are only in the reserve status, include some unsuccessful prototypes, and some weapons totally retired, saying it, of course. While you provide not links supporting your opinion, it is your word vs the word of good sources like warfare.be and other sources. About the last part, we can agree to disagree, of course. Still I would like to explain how I understand it, because it is not like you painted it. There are abundant reports about weapons used by the Armed Forces of Novorussia. We can analyze every case for heavy towed weapons over 100mm and armoured vehicles. BS-3: Very low use. Its presence in the NAF is totally explained by the captures to Ukraine. GT-MU: Very low use. Its presence in the NAF is totally explained by the captures to Ukraine. BTR-4: Surely without use. Its presence in the NAF is totally explained by the captures to Ukraine. ZPU: Very low use. Its presence in the NAF is totally explained by the captures to Ukraine. In this chapter there is not doubt. No-one source repots these weapons as present in the active or the reserve of the Russian Armed Forces. Also its presence in the NAF is totally explained by the captures to Ukraine, in some case taking them from museums. The facts in Novorussia agree with the reports of the sources about Russian warfare. T-54: Very low use. Its presence in the NAF is totally explained by the captures to Ukraine. D-20: Very low use. Its presence in the NAF is totally explained by the captures to Ukraine. T-55:: Very low use. Its presence in the NAF is totally explained by the captures to Ukraine. T-64: Extensive use. Its presence in the NAF can be explained by the captures to Ukraine. The warfare of some age that is not recognized by all the sources as present in the Russian active and reserve warfare, is just the group of warfare where we can have some doubt about its presence or not, since the sources offer contradicting data. The rest of the options are far more evident. If all the sources agree about a piece of warfare being not present, it is difficult to say the contrary. If all the sources agree about a piece of warfare being present, the same. And if some sources say that a new modern piece of warfare is present and others not, we can have some doubt, but the trend is in favor of its introduction in the Russian Armed Forces. In this group we have 2 cases very interesting for the analysis. These two elements of the two of the most important warfare families used in this war are key to understand what I'm saying about. The D-20 (the towed version of the 2S3), is the most advanced piece of artillery that is not recognized by all the sources as present today in the Russian active and reserve warfare. And the T-64, is the most advanced tank that is not recognized by all the sources as present today in the Russian active and reserve warfare today. About the D-20. we see that its presence in the NAF has been very low, reduced only to a few units that according to the public reports would have been captured from Ukraine. There are also other pieces of artillery that like the D-20 are not recognized by all the sources as present in the Russian active or reserve warfare. I cited in previous messages some cases from warfare.be and from The military Balance 2016. All them are less modern than the D-20, and no-one of them is reported as used by the NAF. In the other side, when we look from the D-20 to the next in line pieces of artillery that are universally recogniced as present still in the Russian active or reserve warfare, we see how the ZU-23-2, 2B9 Vasilek, 2A36 Giatsint-B, 2B16 Nona-K, D-30, MT-12 Rapira and the 2A65 Msta-B have been extensively used by the NAF, and in some case like for the 2B16 Nona-K its presence likely is not totally explained from captures of Ukranian material. If the D-20 would be available which would be the reason to see not them extensively used by the NAF, when the same gun mounted in the 2S3 is used by the NAF? There is not reason. It hurts the arguments of the sources who defend still its presence in the Russian Armed Forces, and by extension it hurts the arguments of the same sources about other pieces where there is not agreement about its presence in the Russian active or reserve warfare. About the T-64, we see how this tank has been extensively used. Looking at the other cases where the sources agree not about its presence in the Russian active or reserve warfare, we see a very low use (T-54 and T-55) explained totally from the captures of Ukranian warfare, or we see it used not (T-62 or PT-76). In the other side, the T-72 has been used by the NAF, but has not been used by the Ukranian forces until recently because they were not combat ready. I tend to think, that if more T-64s would have been available in Russia, the T-64s would have been provided first, and surely in bigger amouths than the T-72. 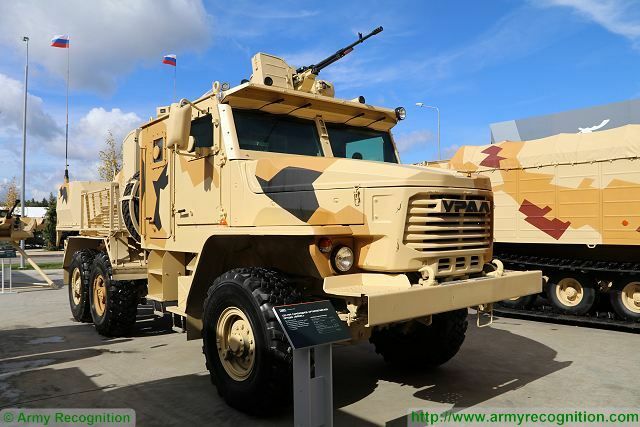 - For the cases where the sources agree not about the presence of a veteran warfare piece in the Russian Armed Forces, in most of the cases this weapon is not available for the NAF, and when it is available, its presence is explained by the captures from Ukraine. The facts in Novorussia with the D-20, the T-64, and the rest of the warfare in this situation, that is not reported to be used in Novorussia, lead me to think that when the sources disagree about the presence of some piece of warfare in the Russian active or reserve warfare this can be exhausted, something that would make sense to me, because it is unlikely that some sources begin to retire their data about the presence of some piece of warfare without see some evicence of its total retirement. - For the cases of the less modern warfare where all the sources agree about its presence in the Russian active or reserve warfare, we see how all are present in the NAF, with most of them extensively used by the NAF, and also we see how in some cases their presence is not totally explained by the captures from Ukraine. Said it, which is different lf what you commented, we can agree to disagree. Then you mean is the 152mm Coalition a gun/mortar system like the 120mm Vena... and clearly the answer is no. There are no 152mm mortar bombs in the Russian inventory AFAIK. Or are you trying to say Howitzer? The difference between a gun and a howitzer is that the latter can generally elevate to very high angles (like a mortar) but can also use variable charge propellant, often in bags that allow low power shorts for short range volleys at high elevation where the lower propellant charge means the round does not go up in the air very high so it hits the target quicker and spends less time in the air, or extra propellant can be used to extend range for longer range shots. A Howitzer generally has a heavier shell and shorter maximum range than a gun as well as a shorter barrel and lower muzzle velocity. Modern Guns are actually Gun/Howitzers in the sense that they often have variable propellant options and while they often have very long barrels for max range they generally can elevate to very high elevations too. would be room for a new weapon of 152mm in the mold of the 2A80 weapon of 120mm, that can be used as mortar perfectly. Why? Why develop a brand new calibre? A 240mm mortar can't outrange a 122mm gun, so any 152mm calibre mortar wont outrange existing 240mm mortars and wont come close to current 152mm guns let alone outrange them. Why would a 70km range Coalition in 152mm calibre adapt to firing 152mm mortar rounds likely with a range of 12-14km.... especially when existing 120mm gun/mortars can reach 13km range targets already. There is no value in introducing a new calibre of Mortar round inferior to already existing calibres (160mm and 240mm). I have read reports that the Russian military find the 160mm mortar to be useful in mountain warfare and that such weapons were kept especially for such units. I have not read anything regarding their being withdrawn from their reserves. When I read a report stating all 160mm are out of reserves and scraped or sold off then I will agree with your assessment. And I prefer Russian military sources rather than third party sites. Assuming the presence of equipment in rebel hands is explained either by being captured from government forces or given by Russia (either directly or a blind eye to smuggling) is one thing but deducing that because a type of weapon is not in Russian service or reserve because it is not being used in the Ukraine conflict is just wrong. The 160mm calibre mortar is a perfect example of how your logic fails. Why would Russia give rebels in the Ukraine a weapon it is keeping for mountain warfare? More importantly why would it give it a weapon that the Ukraine does no produce ammo for? At 41kgs per shell it is a very powerful weapon, but the need for ammo that is not available on the battlefield makes it not very useful... especially when its accuracy is not amazing with standard dumb rounds. Instead of giving them a few 160mm weapons they will have no ammo for, it makes rather more sense to give them 152mm and 120mm weapons they have ammo for and can use. If something is flawed here is your argument. While you defend that would not be room for a mortar use of the 152mm caliber, because Russia has the 120mm and 240mm mortars, you defend that the 160mm towed mortar designed in the 1940s is still in the Russian reserve because "there has been nothing developed to replace their capability.". Also while you say that to expand the use of the 152mm caliber to mortar applications would means to "develop a brand new calibre", you defend the use of the 160mm that is dead at this point. Every standardization rule would lead to prefere the 152mm also for mortar use. And you keep providing zero evidence in support of your opinion. No link to credible and modern sources that defend explicitly that the M-160 mortar is in the Russian reserve at this point. Which units are these that are keeping 1940s mortars? They are also keeping ammunition of the same age? No credible and modern link outside the sources in conflict, in support of the sources that still defend the presence of some weapons in the Russian active or reserve warfare. Can you point out the flaw in my reasoning please. Where is the flaw in that reasoning? At the moment 120mm mortars are doing the job and they have said they have 240mm mortars in reserve just in case. In that situation why does the Army need to spend more money developing a whole new calibre. Gun Mortars are Mortars with barrel extensions to increase velocity to make them longer ranged so they can replace guns in some situations. In the case of the 120mm mortars it made sense because a barrel extension allowed muzzle velocity to be increased to the point where it could get a range almost as good as the 122mm gun but with a heavier shell and the ability to fire 120mm mortar ammo. The opposite does not make sense. Taking a high pressure 152mm long range gun (70km) and loading a low pressure mortar round is odd because the length of the barrel is enormous but the range of a mortar fired would be rather short... 10-12km. The payload will be a 40kg projectile, but they already have 240mm weapons in reserve that can exceed that significantly so why develop a new round to replace something already invented and in service in reserve? If they need something more powerful then why are the 160mm and 240mm not in front line service? My logic suggesting the 160mm mortars are still in reserve is based on the fact that they have no in service replacement or anything known in development. There is no value in standardisation of things that are not the same. There is no value in creating a new mortar calibre in the 152mm size if the current and projected 152mm weapons (tank gun and artillery piece calibre) are for different purposes. Just look at the 73mm gun of the BMP-1... they had not used that calibre before in that weapon range... if it was properly standardised it should have been a 76.2mm calibre and it easily could have if they wanted, but why standardise the calibre of a medium velocity rocket weapon with a gun where there is no compatibility... 76.2mm guns could never fire the 73mm rocket and the 73mm gun on the BMP would not stand up to firing any type of Russian 76.2mm ammo. If they are not compatible there is no value in making them the same calibre. Making Coalition able to fire 152mm mortar shells would be like adapting Kornet to fire RPG-7 rockets... a Kornet operator wont want to get within 500m of a target to fire an RPG-7 rocket when it can fire 8.5km range missiles at armoured targets and 10km range missiles at soft ground and air targets. Coalition wont operate with front line units on the front line... they will sit back and hit targets as they are passed target data. For a mortar carrier with a 120mm mortar on an armata chassis that will be operating nearer the front line it makes more sense for it to engage targets close to its own troops and itself. Based on your arguments you should be suggesting Coalition replace both the Mortar carrier, the 152mm artillery (MSTA) AND the MBT version of the armata vehicle. After all if it can fire long range 152mm artillery shells and 152mm mortar bombs then why not 152mm tank rounds too. It can direct fire and indirect fire all these rounds so why not just have the one vehicle? Obviously because 152mm artillery wont be on the front line where MBTs are needed and near the front line where 120mm mortar carriers operate. I am not suggesting they are keeping the M43 in reserve... they would be keeping the M-160 from the 1960s in reserve. I have seen no official listings of in service or reserve material so it comes down to estimates and appraisals and assumptions. I just think it makes more sense to keep 160mm in reserve for units that would find its extra power useful... ie in mountains, and for the rest of their military the more powerful 240mm weapons are in reserve for situations where more power is needed. AFAIK there is no problem with the 120mm mortars they have in service or are putting into service... the models I have seen of the armata family seem to show a 120mm mortar carrier and I don't think they will be in any rush to replace it as it remains an excellent weapon for the job at hand. The flaw here is perfectly clear. While there is not room for the 152mm caliber for mortar use, "there has been nothing developed to replace" the "capability" of the 160mm mortar = there is room for the 160mm caliber for mortar use. Pretty contradictory. Following your argument, a 152mm gun mortar (like the 120mm gun mortar that you praise) mounted on armata, kurganets or bumerang platforms would not be able even to replace the capabilities of the M-160 towed mortar developed in the 1940s. How bad must be in your view the armata, kurganets and bumerang platforms for the use in mountains. Or maybe the 8mm matter a lot. The flaw here is that you even see not the standardization value of going from two calibers (152mm, 160mm) to one (152mm). It asuming your position about the 160mm being still a living caliber, where I do not agree. Like all the ammunition of 120mm is not mortar ammunition, and you call not it two different calibers, to have mortar ammunition of 152mm in adition to other types of ammunition would not mean "creating a new mortar caliber in the 152mm size". I never said it, you was who said that the 2S35 was able to fire in mortar style. I commented that I would expect a new gun for 152mm that combines direct and indirect fire (including mortar style), in the mold of the 120mm gun mortar that you praise (and I also consider successful). Again, the flaw here is obvious. One link for you see how the M-160 is from the 1940s and not from the 1960s (the first in the list). In fact every source is unofficial listing about the warfare present, active or in the reserve. And in some cases there is not agreement between them. For these cases I try to form my opinion according to the facts that are public. There are multiple public reports/links about the use of the Russian warfare in Russia and in other places, that can be used in support of the own opinions. But the 160mm mortar was found to be too heavy for general use and was only found to be useful in mountains... considering the 240mm mortar would also be useful in the mountains and as both would need to be vehicle mounted due to weight of the weapons and the ammo why would you make a new weapon to replace the 160mm weapon? I would say it does not make sense to scrap them if they are effective in a niche role, but not replace them either. Following your argument, a 152mm gun mortar (like the 120mm gun mortar that you praise) mounted on armata, kurganets or bumerang platforms would not be able even to replace the capabilities of the M-160 towed mortar developed in the 1940s. It is not a gun/mortar. If you converted the 240mm mortar with a much longer barrel you could make it a gun/mortar but a gun can't be converted into a mortar that way. There are guns... which are generally direct fire weapons of high velocity... their advantage is long range... their problem is they normally don't fire much above about 45 degrees and if they do their high velocity means their shells go very high up which means more time for wind and even the earths rotation to reduce accuracy... especially a close range targets. Their flat trajectory also means some targets behind hills or high ground can't be hit. Guns generally have a fixed large propellant charge. If you think of a very tall building in a city... if you stand behind that a gun can't get you because its flat trajectory means the shell can't come down directly upon you without hitting the building you are standing behind. There are also Howitzers, which have shorter barrels, less muzzle velocity, less range... often a heavier shell, and variable propellant that means for close range shots you can reduce the propellant load so the lofted shell does not go up so high and comes down on the target much quicker. A gun/mortar is a Howitzer that can fire mortar bombs.... it has variable propellant and can elevate above 45 degrees. The 152mm gun of the Coalition is technically a gun/howitzer in that it has variable propellant and high elevation, but it has the long barrel and long range of a gun. The M160 fires a 40kg projectile over relatively short distances. Even an in service MSTA with its 152mm gun can fire a 40kg shell much further, but why would they want to spend good money developing a new type of ammo for a vehicle that is already able to exceed this performance? The 120mm gun/mortar is a mortar with a longer barrel able to fire mortar bombs and shells to distances close to the range of the 122mm howitzer. By making its barrel longer you get a weapon that can replace both the standard vehicle mounted 120mm mortar and the standard vehicle mounted 122mm gun with one weapon of similar range with ammo that is just as powerful. How bad must be in your view the armata, kurganets and bumerang platforms for the use in mountains. Or maybe the 8mm matter a lot. They will have 240mm mortars for mountain use in reserve... why would you need to waste money developing a capability for the Coalition that it does not need? Standardisation only makes sense when one thing can do both jobs. Considering that the 160mm mortar is a very specialised system with very specific uses it does not make sense to adapt the 152mm to do the same role... it is simply not worth the money. A mortar bomb is a specific type of ammo. If you want to develop a 152mm mortar round then you have to develop a new mortar bomb. The 152mm Coalition already can cut its propellant charge to a different size to alter range... using existing ammo it could simply cut the propellant charge down to a 10th and fire the standard shell to 12km or so if you wanted to I guess, but the Coalition would never operate so close to the frontline that this would be useful. The mortar carrier variants of armata and typhoon and boomerang and kurganets on the other hand will be operating supporting infantry so their 120mm gun/mortars will get lots of use. Coalition is a gun/howitzer... it is not a mortar. For these cases I try to form my opinion according to the facts that are public. There are multiple public reports/links about the use of the Russian warfare in Russia and in other places, that can be used in support of the own opinions. The facts that are public is that the 160mm mortar is considered an excellent weapon in mountain warfare. Nothing has been adopted that could easily replace it except perhaps the 240mm mortar. Absence of evidence is not evidence of absence... just because they don't mention it does not mean it is gone. Again I have to say that my opinion is based on facts, and agrees with the public reports. - The M-160 has been excluded of the lists of Russian active or reserve warfare in good sources like warfare.be. - There are not reports about recent use of units of this weapon with origin in the Russian active or reserve warfare, that contradicts the accuracy of the exclusion of this weapon of the lists. You can link the videos about the towed M-240 to see if they are modern (at least from 2014-5). Ten years ago, the presence of these old weapons was real, but now. after the last decommission wave between 2010 and 2013 approximately that retired even the T-64, there is not evidence of it. The source that I linked to see that the M-160 is from the 1940s, is a list of material developed by Russia or used by Russia, but it says nothing about the current presence of a weapon in the Russian active or reserve warfare. This is a very complete source, but sometimes is not very updated (some chapters are without update since 2007-2008). I doubt they would continue to keep the towed 240mm mortars in reserve. The 2S4 on the other hand is reportedly being kept in reserve for future potential use. They have developed guided shells which would make it a very potent weapon for very specific roles. Regarding the M160 absence of evidence is not evidence of absence. They did not build a huge number of weapons in the first place and it was never intended to be a standard weapon used everywhere. The exclusion of the M-160 of the lists of good sources is not absence of evidence. It is active evidence against its presence in the Russian active or reserve warfare. The problem is that the definition of a good source is one that is accurate... how can you check the accuracy of such sources? Without an official source it is all just guesswork, so any opinion is as valid as any other. AFAIK the 160mm mortar was considered effective in mountain warfare at a time when the 240mm mortar was also available. The fact that they kept it in service in that role suggests it was effective and the best option. There has been no replacement developed or put in service AFAIK. All the other kit that likely has been scrapped like the T-34 and T-54/55 etc etc had replacements in service and newer models available to put in their place in reserve. Why scrap the 160mm mortars when there is nothing to replace them in service or in reserve? From other threat, the data about serviceability also reflects how low is the number of old armoured vehicles, surface-air, surface-surface and artillery pieces remaining in the Russian Armed Forces after the last decommission wave, and agree with the sources that excluded the oldest military warfare from their lists of Russian active and reserve warfare. The data about the aerospace forces instead, make think that important numbers of the Su-17/20/22, MiG-27, MiG-25 and MiG-23 can remain still in the Russian reserve, something that makes sense to me, because these aircrafts are not outdated as warfare concept. 120mm self-propelled artillery gun "Phlox"
State Secretary, Deputy General Director of JSC "Scientific and Production Corporation" Uralvagonzavod "Alex Zharich on his page on www.facebook.com posted photos of a new 120-mm self-propelled artillery" Phlox "developed by JSC" Central Research Institute "Petrel " (Nizhny Novgorod). SAO sample "Phlox" will be shown for the first time at the opening exhibition "Army 2016". 120-mm automatic cannon "Phlox" performed in an armored wheeled chassis "Ural-BB" (6x6). 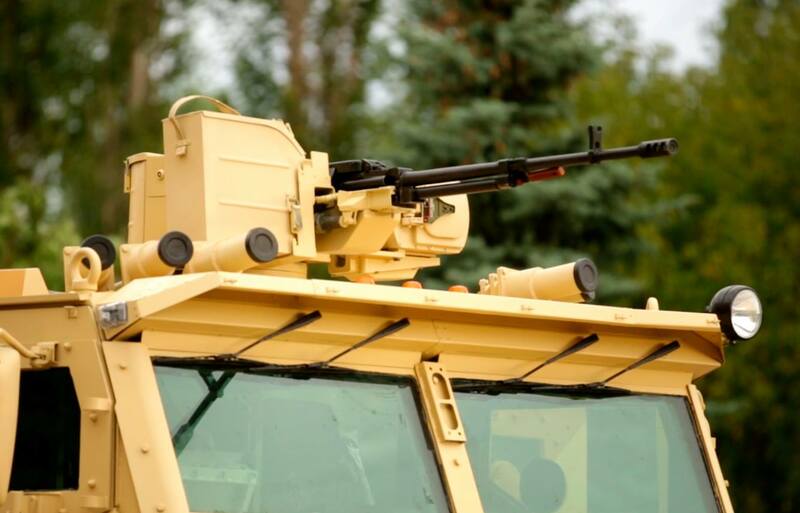 On the roof of the armored cab is remotely controlled weapon module with 12.7-mm machine gun "Kord". Protection against guided weapons system provides a laser detection and jamming. It seems very interesting to export. For Russia I like more the 2S36 Zauralets-D.
Actually I quite like this new vehicle. It seems to have a gun mount with ammo, whereas the Tigr with a 122mm gun on its back looks external and needing an external human loader. This further suggests 122mm towed and self propelled guns might be getting withdrawn from active service in favour of 120mm gun/mortars. That would make sense as the new 120mm gun mortars could replace existing 120mm mortars and 122mm guns both towed and self propelled. This would eliminate one calibre from the front line ammo supply chain, yet with a longer barrel 120mm weapon you wont lose much in terms of range performance. GarryB wrote: Actually I quite like this new vehicle. The 2S1 is a weapon that remains actual and very useful. Russia has the 2S34 if want to replace the 122mm caliber, at the rithm they want to do it. Of course Russia will not eliminate the 122mm until its stored ammunition of this caliber is finished. I do not think this new vehicle would have advantage over the 2S34. With the 2S34 and the 2S36, for me this new vehicle can be a model for export. Some technical info about the "Floks"
The Phlox (Floks) is 120mm wheeled self-propelled howitzer / mortar carrier developed and designed by the Russian JSC Central Research Institute Burevestnik, a subdivision of UralVagonZavod. The Phlox was unveiled during Army 2016, the International Military Technical Forum which was hedl near Moscow (Russia) from the 6 to 11 September, 2016. The Phlox is an artillery system which combines the capacities to be used as mortar and howitzer. This artillery system is designed to conduct firing missions against stationary and moving targets by mortar shells and high-precision projectiles. It can be used for direct and indirect fire. According to a contract signed with the Russian MoD (Ministry of Defense), the company is to conduct the trials of the 120mm Flox SPG before September 2018. This new vehicle is marketed by Uralvagonzavod to response on new request of international military market and for the Russian armed forces. 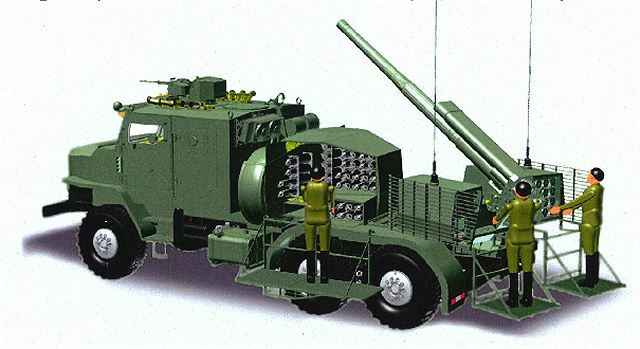 The main armament of the Phlox artillery system consists of one 120mm mortar/howitzer which can fires mortar bombs or artillery shells. It can fire a full range of ammunition as HE (High Explosive) projectile, guided projectile and HE mortar rounds. With mortar ammunition, the Phlox has a maximum range of 7.5 km and 13 km with artillery shells. 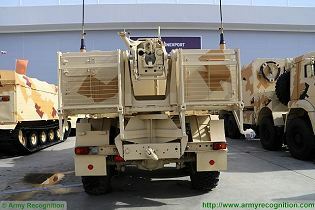 The main armament is mounted at the rear of a truck chassis with an elevation from -5° to 80° and a traverse of around 35°. The gun has a rate of fire from 8 to 10 projectiles per minute. On the top of the crew cab is mounted a remotely operated weapon station which can be armed with a 7.62mm or one 12.7mm machine gun. A bank of four smoke grenade dischargers is mounted on each side of the crew cab roof. The Phlox vehicle carries at total of 80 ammunition, with 28 rounds ready to use. In firing position, the 120mm mortar/cannon is loaded manually by two operators located at the rear of the truck. The 120mm Phlox artillery system is based on a 6x6 truck chassis with a crew cab a the front and the 120mm artillery weapon at the rear. It has a crew of four including driver, commander and two operators. The crew cab is protected against firing of small arms and shell splinters. There is two single doors on each side of the crew cabin fitted with bulletproof windows with firing port in the center. The truck carries a total of 80 ammunition, with 16 rounds stored in a box located at the right side of the truck chassis, the remaining ammunition are located in a small shelter located at the rear of the crew cab. The 120mm Phlox artillery system is based on a modified 6x6 cross-country truck chassis Ural-4320. This truck is motorized with a turbocharged diesel engine, developing 300 hp. coupled to a five-speed gearbox. The truck can run at a maximum speed of 75 km/h with a maximum cruising range of 1,000 km. 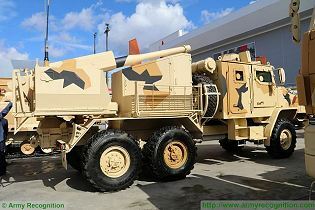 The 120mm Phlox artillery system is fitted with a a Shtora-like electro-optical jammer that disrupts antitank guided missiles, laser rangefinders and target designators. The Phlox is also fitted with an autonomous power supply unit to operate the main armament when the main engine is out of work. Standard accessories of the vehicle includes a central tyre inflation system, NBC protection system, heating and navigation and orientation system. The crew cabin is also fitted with computerized firing control system. 1,000 kms range? Isn't that too much? Ammo capacity is good, even better is an/some ammo carrier truck(s) supports the "Floks" system or a battery of 6 systems. It is very interesting data. The fact that the crew is out, unprotected while firing, makes this new system some step back the 2S1, 2S34, 2S36, and even of the 2S23 and 2S9, on safety of the crew. It makes unlikely the adoption of this system by the Russian Armed Forces. I do not think it would meet the current Russian requirements on safety of the crew. Otherwise this system would be far ahead of towed artillery.